Using ChrisPC Media Streamer you can broadcast your favorite TV shows, Movies, radio stations to your friends through local networks and through internet. You will be able to broadcast from up to 3 media sources at the same time (only 2 media sources during the FREE trial version). 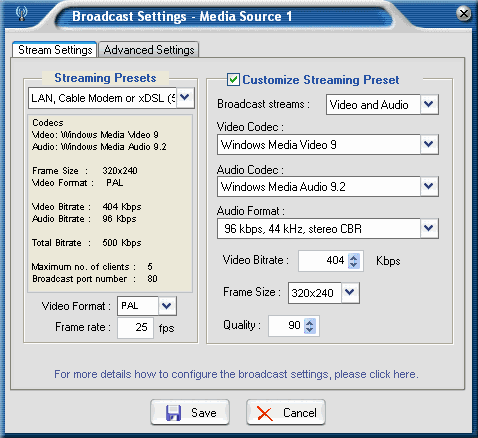 ChrisPC Media Streamer offers 3 options for your broadcasts: Video & Audio, Video only, Audio only. Also you can choose the frame size and video/audio bitrates depending on clients' internet connection bandwidth. After the broadcast is started in ChrisPC Media Streamer, your friends can connect to your computer to watch it. PORT is the value you have set in the media source's broadcast settings window, default is set to port 80.